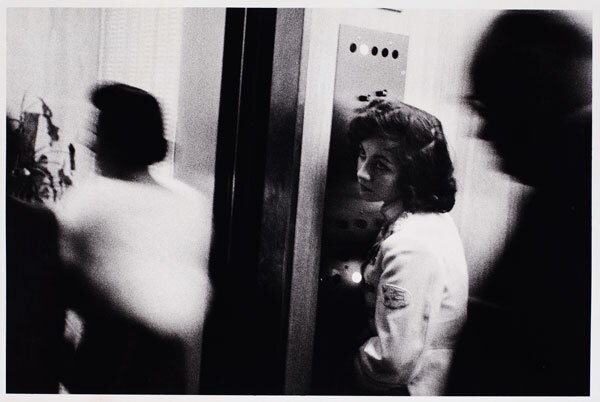 Ian Padgham, our marketing and communications assistant, with a fantastic story about the elevator girl in Robert Frank’s famous photo…and do come down if you’ve yet to see Looking In: Robert Frank’s “The Americans”— it closes Sunday. “Robert Frank, Swiss, unobtrusive, nice, with that little camera that he raises and snaps with one hand he sucked a sad poem right out of America onto film, taking rank among the tragic poets of the world. To Robert Frank I now give this message: You got eyes. Such are the closing words of Jack Kerouac’s introduction to Robert Frank’s book of photographs, The Americans. For me, these three sentences sum up in beautiful Beat wisdom the bittersweet essence of Frank’s work. America is a sad poem, but nestled within that sadness is a sweetness that calls us siren-songlike into something profound. Aside from the incredible pay that accompanies a museum job there is an entire array of employee perks that make working at a nonprofit worth your while. We get to meet artists behind the scenes, see art that is not on display, enter all museums free, and roller skate through the galleries during off hours (okay, I was kidding about seeing art not on display). We also—and this is my favorite—have staff “walkthroughs” of the exhibitions: a sneak peak with a curator where you get to hear all the great stories behind the exhibition. Long story short: Several days before the staff walkthrough Kenneth Baker of the San Francisco Chronicle came and reviewed the Robert Frank show. He then proceeded to write his review and included in his article the very same picture to which Kerouac had dedicated his amorous last line. His article was edited, formatted, and finally printed and sent off to the delivery vans. One of those vans delivered one of the copies of that Chronicle to the house of a certain Sharon C. of San Francisco, who opened it and found, sadly staring into space, her very own 15-year-old face. After what was probably a moment of surreal disbelief also worthy of a Twilight-Zone episode, she picked up the phone and called the SFMOMA Communications office. After ringing several times her call was finally answered by a young man who had just gone through a Robert Frank exhibition walkthrough and who was less than happy about answering the phone. @kerouac: name is Sharon, Pacific Heights, and no longer lonely. Adios, King. great story, i love how you tied it together in the end. hire me! sounds like you guys love your jobs over there. In the original Frank photo, doesn’t that shadowy silhouette looking behind “Sharon” resemble the late actor William Frawley who played Fred Mertz in I Love Lucy? No wonder she’s shrinking away from him. He was always a terrifying 50s presence. 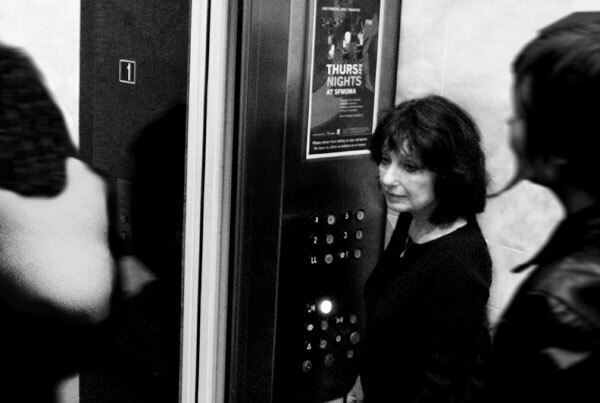 In the photo taken recently, “Sharon” looks like she has more self-esteem, while the other faceless figures in the elevator have grown even more blurred and demonic than before. plug1 – So glad you liked it! Keep an eye on our job listings: http://www.sfmoma.org/pages/jobs – SFMOMA is an awesome place to work. Kevin – I am not going to lie: I totally photoshopped the new photo to try and make it look like the original (bad idea?). I was thinking more Hitchcock than William Frawley, though. This story makes me love this photo, even more than I already did. THANK YOU. Silly: If I remember correctly she didn’t remember at all the experience of having her picture taken. She was amazed, however, when she saw Frank’s contact sheets at SFMOMA and saw that he actually had taken several shots of her and it seemed as if she was posing in a couple of them (I might have that a little mixed up, though, so don’t quote me on that!). I think that she has loved having her picture in the museum – she has come in several times to show friends and I’ve been in touch with her a few times since we met up. We also sent our updated photo of her to Frank’s gallerist and he supposedly loved the story. If only Kerouac were still around we could have had a reunion! You must have felt quiet special living through all that. Shame that Kerouac is not here to read anymore, he would have love it! You managed giving a name to at least one anonymous actress who played her part in such an exhibition, I imagine how proud she is to be part of his Art. This post made my day. What a story. Plus you’ve found a way to make a tweet seem like a new form of haiku. Bravo Sir. Wonderful story… what are the odds? Great story. That exhibition is coming to the Met in NY and I look forward to seeing it, and Sharon, here. Hi, this is Sharon C.
The photo of me in Robert Frank’s “The Americans” was taken when I was just fifteen years old, I had lied and told them I was eighteen to make working there legal. It has been a total trip being a part of art and poetry history. Ian got it right, and since I will be in NYC soon, I just might wander over to the Met and see myself there! I thank Ian and the MOMA curators for their kindness. Sharon, here you are – the circle is complete! Who knows, maybe your story not being in the Chronicle could actually be a good thing – now it means some paper can pick it up while you’re in NY and really take it big time! I could see an article in the NY Times or maybe Dave Eggers could do a brilliant New Yorker piece. We’ll say we knew you when! PS: one part that I left out of the post but which I thought was amazing was the fact that as a professional you had worked approving grants for major institutions (such as, cue the goosebumps, SFMOMA). I think we should also pitch your story to M. Night Shyamalan – this could be the unbelievable “twist” story he’s been waiting for since The Sixth Sense. Great story Ian and Sharon C.! Thanks for sharing it. Just got a call from NPR — who knows if it will happen but they might be interested in featuring it on a show this weekend! Keep your fingers crossed!! Great story and wonderful series of events, Ian. It smacks to me, though, more like a Paul Auster novel, particularly the “true” stories of such odd circular happenstances he writes about in his book “The Red Notebook.” Regardless, I will be listening to NPR this weekend (as I always do) in case something ends up on the air about Sharon C. and this photograph. Wow! Serendipity astounds. Thank you for sharing and for loving your job. @Ian: i will def keep my eyes on your job board. i would LOVE to work for the SFMOMA. seriously, i would be so happy there. This is Sharon C again. Just did the NPR interview to be aired tomorrow,Sunday 8/30 on All Things Considered. Let’s hope I didn’t bungle my own story! If the NY TImes wants it, I’ll be there Sept 9-18! Many thanks to you and MOMA for this bit of fun in my life! P.S. I mentioned my grantmaking to MOMA during the interview! Thanks for the nice behind the scenes story. My wife and I went to San Francisco in early August and my prime reason was to see the Robert Frank exhibit at MOMA. ( My wife wanted to see the Adams/O’Keefe exhibit.) I loved the Frank exhibit and purchased a copy of “The Americans” which I have been poring over ever since we returned. Having been in college when this was his book was published I didn’t read it at that time. Yesterday, as my wife was chatting on the phone with her sister I head Sharon Collins on NPR. She didn’t bungle her story-it was so sweet. Thanks for having such a wonderful exhibit and I know there are thousands of us that envy you those behind the scenes roller skating excursions. In 23 years in the museum business I never had anything quite this great, but a few near misses. What a terrific story! I felt like I was seeing myself in Sharon. I, too, grew up in Miami and worked briefly at a beach hotel. Her expression in the picture seemed to be a mirror of my own soul in the 50’s and 60’s. Like Sharon, I am a happier soul these days. Thanks for a piquant story. Susan – I really appreciate your reply. There has been a lot of buzz on the NPR version of this story with people arguing about what her expression means and what she was really feeling in the picture. While I think many people can identify with a sense of teenage loneliness it’s interesting to read a comment from someone with a similar life experience and a sense of self identification with the image. I’m glad you enjoyed the story and happy to have read your reply! This is one of the best museum social media stories ever! Openness and curiosity returns wonderful rewards. Exactly what an institution like SFMoMA should be doing. Way to go Ian! “For some people a camera is armor. For Mr. Frank it was an antenna, a feeling and thinking device”.